St Andrews (Latin: S. Andrea(s); Scots: Saunt Aundraes; Scottish Gaelic: Cill Rìmhinn) is a town on the east coast of Fife in Scotland, 10 miles (16 km) southeast of Dundee and 30 miles (50 km) northeast of Edinburgh. St Andrews has a recorded population of 16,800 in 2011, making it Fife's fourth largest settlement and 45th most populous settlement in Scotland. 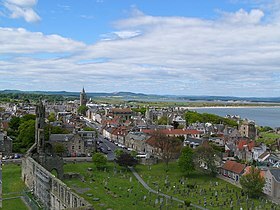 The town is home to the University of St Andrews, the third oldest university in the English-speaking world and the oldest in Scotland. According to some rankings, it is ranked as the third best university in the United Kingdom, behind Oxbridge. The University is an integral part of the burgh and during term time students make up approximately one third of the town's population. The town is named after Saint Andrew the Apostle. There has been an important church in St Andrews since at least the 747 AD when it was mentioned in the Annals of Tigernach, and a bishopric since at least the 11th century. The settlement grew to the west of St Andrews cathedral with the southern side of the Scores to the north and the Kinness burn to the south. The burgh soon became the ecclesiastical capital of Scotland, a position which was held until the Scottish Reformation. The famous cathedral, the largest in Scotland, now lies in ruins. St Andrews is also known worldwide as the "home of golf". This is in part because The Royal and Ancient Golf Club of St Andrews, founded in 1754, which until 2004 exercised legislative authority over the game worldwide (except in the United States and Mexico). It is also because the famous St Andrews Links (acquired by the town in 1894) are the most frequent venue for The Open Championship, the oldest of golf's four major championships. Visitors travel to St Andrews in great numbers for several courses ranked amongst the finest in the world, as well as for the sandy beaches. The Martyrs Memorial, erected to the honour of Patrick Hamilton, George Wishart, and other martyrs of the Reformation epoch, stands at the west end of the Scores on a cliff overlooking the sea. The civil parish has a population of 18,421 (in 2011). The town also contains numerous museums, a botanic garden and an aquarium. The earliest recorded name of the area is Cennrígmonaid. This is Old Gaelic and composed of the elements cenn (head, peninsula), ríg (king) and monaid (moor). This became Cell Rígmonaid (cell meaning church) and was Scoticised to Kilrymont. The modern Gaelic spelling is Cill Rìmhinn. The name St Andrews derives from the town's claim to be the resting place of bones of the apostle Andrew. According to legend, St Regulus (or Rule) brought the relics to Kilrymont, where a shrine was established for their safekeeping and veneration while Kilrymont was renamed in honour of the saint. This is the origin of a third name for the town Kilrule. The first inhabitants who settled on the estuary fringes of the rivers Tay and Eden during the mesolithic (middle stone age) came from the plains in Northern Europe between 10,000 and 5,000 BCE. This was followed by the nomadic people who settled around the modern town around 4,500 BCE as farmers clearing the area of woodland and building monuments. In the mid-eighth century a monastery was established by the Pictish king Oengus I, traditionally associated with the relics of Saint Andrew, a number of bones supposed to be the saints's arm, kneecap, three fingers and a tooth believed to have been brought to the town by St Regulus. In AD 877, king Causantín mac Cináeda (Constantine I or II) built a new church for the Culdees at St Andrews and later the same year was captured and executed (or perhaps killed in battle) after defending against Viking raiders. In AD 906, the town became the seat of the bishop of Alba, with the boundaries of the see being extended to include land between the River Forth and River Tweed. In 940 Constantine III abdicated and took the position of abbot of the monastery of St Andrews. The establishment of the present town began around 1140 by Bishop Robert on an L-shaped vill, possibly on the site of the ruined St Andrews Castle. According to a charter of 1170, the new burgh was built to the west of the Cathedral precinct, along Castle Street and possibly as far as what is now known as North Street. This means that the lay-out may have led to the creation of two new streets (North Street and South Street) from the foundations of the new St Andrews Cathedral filling the area inside a two-sided triangle at its apex. The northern boundary of the burgh was the southern side of the Scores (the street between North Street and the sea) with the southern by the Kinness Burn and the western by the West Port. The burgh of St Andrews was first represented at the great council at Scone Palace in 1357. St Andrews, in particular the large cathedral built in 1160, was the most important centre of pilgrimage in medieval Scotland and one of the most important in Europe. Pilgrims from all over Scotland came in large numbers hoping to be blessed, and in many cases to be cured, at the shrine of Saint Andrew. The presence of the pilgrims brought about increased trade and development. Recognised as the ecclesiastical capital of Scotland, the town now had vast economic and political influence within Europe as a cosmopolitan town. In 1559, the town fell into decay after the violent Scottish Reformation and the Wars of the Three Kingdoms losing the status of ecclesiastical capital of Scotland. Even the University of St Andrews was considering relocating to Perth around 1697 and 1698. Under the authorisation of the bishop of St Andrews, the town was made a burgh of barony in 1614. Royal Burgh was then granted as a charter by King James VI in 1620. In the 18th century, the town was still in decline, but despite this the town was becoming known for having links 'well known to golfers'. By the 19th century, the town began to expand beyond the original medieval boundaries with streets of new houses and town villas being built. Today, St Andrews is served by education, golf and the tourist and conference industry. St Andrews is represented by several tiers of elected government. The Royal Burgh of St Andrews Community Council, meeting on the first Monday of the month in the Council Chamber of the Town Hall, forms the lowest tier of governance whose statutory role is to communicate local opinion to local and central government. The current Chairman is Mr Callum MacLeod. Fife Council, the unitary local authority for St Andrews, based in Glenrothes is the executive, deliberative and legislative body responsible for local governance. The Scottish Parliament is responsible for devolved matters such as education, health and justice while reserved matters are dealt with by the Parliament of the United Kingdom of Great Britain and Northern Ireland. The first parliament to take place in the town was in 1304, when King Edward I came to be received by Bishop William de Lamberton as overlordship of Scotland. As many as 130 landowners turned up to witness the event ranging from Sir John of Combo to Sir William Murray of Fort. In the early days of the union of 1707, St Andrews elected one member of parliament along with Cupar, Perth, Dundee and Forfar. The first elected parliament was introduced on 17 November 1713 as St Andrews Burgh, which merged with Anstruther, the result of a reform bill in 1832. The act of reformation seats in 1855, would find one MP sitting for St Andrews Burgh (which would include Anstruther Easter, Anstruther Wester, Crail, Cupar, Kilrenny and Pittenweem). Prior to 1975 the town was governed by a council, provost and baillies. In 1975, St Andrews came under Fife Regional Council and North East Fife District Council. The latter was abolished when a single-tier authority was introduced in 1996 as Fife Council based in Glenrothes. St Andrews forms part of the North East Fife constituency, electing one Member of Parliament (MP) to the House of Commons of the Parliament of the United Kingdom by the first past the post system. The constituency is represented by Stephen Gethins, MP of the Scottish National Party. For the purposes of the Scottish Parliament, St Andrews forms part of the North East Fife constituency. The North East Fife Scottish Parliament (or Holyrood) constituency created in 1999 is one of nine within the Mid Scotland and Fife electoral region. Each constituency elects one Member of the Scottish Parliament (MSP) by the first past the post system of election, and the region elects seven additional members to produce a form of proportional representation. The seat was won at the 2016 Scottish Parliament Election by Willie Rennie, for the Scottish Liberal Democrats. At EU level, St Andrews is part of the pan-Scotland European Parliament constituency which elects seven Members of the European Parliament (MEP)s using the d'Hondt method of party-list proportional representation. Scotland returns two Labour MEPs, two SNP MEPs, one Conservative and Unionist MEP and one UKIP MEP, to the European Parliament. According to the 2001 census, St Andrews had a total population of 14,209. The population increased to around 16,680 in 2008 and 16,800 in 2012 The demographic make-up of the population is much in line with the rest of Scotland. The age group from 16 to 29 forms the largest portion of the population (37%). The median age of males and females living in St Andrews was 29 and 34 years respectively, compared to 37 and 39 years for those in the whole of Scotland. The place of birth of the town's residents was 87.78% United Kingdom (including 61.80% from Scotland), 0.63% Republic of Ireland, 4.18% from other European Union countries, and 7.42% from elsewhere in the world. The economic activity of residents aged 16–74 was 23.94% in full-time employment, 8.52% in part-time employment, 4.73% self-employed, 1.94% unemployed, 31.14% students with jobs, 9.08% students without jobs, 13.24% retired, 2.91% looking after home or family, 2.84% permanently sick or disabled, and 1.67% economically inactive for other reasons. In 2016, St Andrews was reported to be home to the "Most Expensive Street in Scotland", with average house prices in The Scores in excess of 2 million pounds. St Andrews has a temperate maritime climate, which is relatively mild despite its northerly latitude. Winters are not as cold as one might expect, considering that Moscow and Labrador in Newfoundland lie on the same latitude. Daytime temperatures can fall below freezing and average around 4 °C. However, the town is subject to strong winds. Night-time frosts are common; however, snowfall is more rare. The nearest official Met Office weather station for which data are available is at Leuchars, about 3.3 miles (5.3 km) northwest of St Andrews town centre. Rainfall, at little more than 650 mm per year makes St Andrews one of the driest parts of Scotland, shielded from Atlantic weather systems by several mountain ranges. Over 1 mm of rain is recorded on just under 117 days of the year. Sunshine, averaging in excess of 1,500 hours a year is amongst the highest for Scotland, and comparable to inland parts of Southern England. St Andrews is about the furthest north annual levels of above 1500 hours are encountered. All averages refer to the 1971–2000 observation period. The St Andrews Railway provided a connection to the main Edinburgh to Aberdeen Line at Leuchars railway station. This service was ended in 1969. The St Andrews Rail Link project aims at realising a new high-speed twin-cord mainline rail link via Cupar to the south and west and via Leuchars to the north. Nowadays, the only public transport to reach trains at Leuchars or to connect other towns in Fife is the Stagecoach bus station located near the town centre. Route 99 (and its alternate routes 99A, 99B, 99C, 99D) connects St Andrews to Dundee via Leuchars with buses up to every ten minutes. St Andrews was once bounded by several "ports" (the Lowland Scots word for a town gate). Two are still extant: So'gait port (South Street, now called West Port) and the Sea Yett (as The Pends terminates to the harbour). The West Port is one of few surviving town "Ports" in Scotland and is a scheduled monument. The towers were influenced by those seen at the base of the Netherbow Port in Edinburgh. The central archway which displays semi-octagonal "rownds" and "battling" is supported by corbelling and neatly moulded passageways. Side arches and relief panels were added to the port, during the reconstruction between 1843–1845. The Category A listed Holy Trinity (also known as the Holy Trinity Parish Church or "town kirk") is the most historic church in St Andrews. The church was initially built on land, close to the south-east gable of the Cathedral, around 1144, and was dedicated in 1234 by Bishop David de Bernham. It then moved to a new site on the north side of South Street between 1410–1412 by bishop Warlock. Much of the architecture feature of the church was lost in the re-building by Robert Balfour between 1798–1800. The church was later restored to a (more elaborately decorated) approximation of its medieval appearance between 1907–1909 by MacGregor Chambers. View of the cathedral grounds from the top of St Rule's Tower. To the east of the town centre, lie the ruins of St Andrew's Cathedral. This was at one time Scotland's largest building, originated in the priory of Canons Regular founded by Bishop Robert Kennedy. St Rule's Church, to the south-east of the medieval cathedral is said to date from around 1120 and 1150, being the predecessor of the cathedral. The tall square tower, part of the church, was built to hold the relics of St Andrew and became known as the first cathedral in the town. After the death of Bishop Robert Kennedy, a new cathedral began in 1160 by Bishop Arnold (his successor) on a site adjacent to St Rule's Church. Work on the cathedral was finally completed and consecrated in 1318 by Bishop William de Lamberton with Robert the Bruce (1306–29) present at the ceremony. The Cathedral and associated buildings, including St Rule's Church, are protected as a scheduled monument. The ruins of St Andrews Castle are situated on a cliff-top to the north of the town. The castle was first erected around 1200 as the residence, prison and fortress of the bishops of the diocese. Several reconstructions occurred in subsequent centuries, most notably due to damage incurred in the Wars of Scottish Independence. The castle was occupied, besieged and stormed during The Rough Wooing and was severely damaged in the process. The majority of the castle seen today dates to between 1549 and 1571. The work was commissioned by John Hamilton (archbishop of St Andrews) in a renaissance style which made the building a comfortable, palatial residence while still remaining well-fortified. After the Reformation, the castle passed to several owners, who could not maintain its structure and the building deteriorated into a ruin. The castle is now a scheduled monument administered by Historic Environment Scotland. The apse of the Dominican friary, Blackfriars, can still be seen on South Street (between Madras College and Bell Street). Other defunct religious houses that existed in the medieval town, though less visible, have left traces, as for instance the leper hospital at St Nicholas farmhouse (The Steading) between Albany Park and the East Sands leisure centre. Madras College is the sole secondary school in the town. The school which opened to pupils in 1833 was based on a Madras system – founded and endowed by Dr Andrew Bell (1755–1832), a native of the town. Prior to the opening, Bell was interested in the demand for a school which was able to teach both poor and privileged children on one site. The high reputation of the school meant that many children came from throughout Britain to be taught there, often lodging with masters or residents in the town. The school is now located on two campuses – Kilrymont and South Street (incorporating the original 1833 building). Pupils in S1-S3 are served by Kilrymont and S4-S6 by South Street. Plans to build a replacement for Madras College on a single site have been ongoing since 2006. Originally, the school were in negotiations with the University of St Andrews for a joint new build at Lang Lands on land owned by the University. The plans, which were scrapped in August 2011, would have seen the school share the University's playing fields. In October 2011, a scoring exercise drawn up by the council to decide the best location for the new Madras College was put before parents, staff and the local community to ask for their views. A £40 million redevelopment of the Kilrymont building proved to be most popular and was officially given the go-ahead in November 2011. This decision was met with controversy from parents, staff and the local community. Work on the new school to date has yet to start, following a decision from a group of senior councillors to analyse the other potential sites than push ahead with the controversial redevelopment. This means that the new school, which was expected to be open for August 2015, has now been delayed until at least 2017. 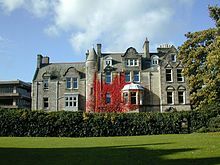 The private school known as St Leonards School was initially established as the St Andrews School for girls company in 1877. The present name was taken in 1882 when a move to St Leonards House was made. The school is now spread across thirty acres between Pends Road and Kinnesburn. A private school for boys was also set up in 1933 as New Park. The operations of the school merged with the middle and junior sections of St Leonards to become St Leonards-New Park in 2005. The University of St Andrews which is the third oldest English-speaking university and the oldest university in Scotland was founded between 1410 and 1413. A charter for the university was issued by Bishop Henry Wardlaw between 1411 and 1412 and this was followed by Avignon Pope Benedict XIII granting university status to award degrees to students in 1413. The school initially started out as a society for learned men in the fields of canon law, the arts and divinity. The chapel and college of St John the Evangelist became the first building to have ties with the university in 1415. The two original colleges to be associated with the university were St Salvator in 1450 by Bishop James Kennedy and St Leonard in 1512 by archbishop Alexander Stewart and prior James Hepburn. St Andrews is known widely as the "home of golf". According to the earliest surviving document from 1552, the "playing at golf" on the links adjacent to the "water of eden" was granted permission by Archbishop Hamilton. The most famous golf course in the town is the Old Course, purchased by the town council in 1894. The course which dates back to medieval times, is an Open Championship course – which was first staged in 1873. Famous winners at St Andrews have included: Old Tom Morris (1861, 1862, 1867 and 1874), Bobby Jones (1927 and 1930 British Amateur), Jack Nicklaus (1970 and 1978) and Tiger Woods (2000 and 2005). According to Jack Nicklaus, "if a golfer is going to be remembered, he must win at St Andrews". There are seven golf courses in total – Old, New, Jubilee, Eden, Strathtyrum, Balgove and the Castle - surrounding the western approaches of the town. The seventh golf course (the Castle) was added in 2007 at Kinkell Braes, designed by David McLay Kidd. Other leisure facilities in the town include a canoe club; junior football team; rugby club (known as Madras Rugby Club); tennis club; university sports centre and a links golf driving range. The East Sands Leisure Centre, which opened in 1988, sits on the outskirts of the town as the town's swimming pool with gym facilities. The University of St Andrews have expressed plans to provide a new multimillion-pound leisure centre to replace East Sands. The 2-mile-long (3 km) beach is adjacent to the famous St Andrews Links golf course. Sand dunes on the beach, which have long protected the golf course, are themselves in danger of eroding away, and are the subject of a restoration project. The Lade Braes Walk is a scenic public footpath of about 1 1⁄2 miles (2.4 km) that follows the route of a medieval mill lade through St Andrews. The walk starts in the town centre near Madras College and runs roughly westward, through Cockshaugh Park to Law Mill. The lade's function was to transport water from a higher upstream point on the Kinness Burn to the water mill in the grounds of St Andrews Cathedral Priory where it arrived at an elevated level simply by following the contours of the land. It may have been built before 1144. In the late 19th century, the lade was covered over and the area from Cockshaugh Park to Law Mill was landscaped and planted with trees. The remains of Law Mill, its grain drying kiln and water wheel are a category C listed building. A Brae is an old Scots word for the high ground adjoining a river bank. The Museum of the University of St Andrews is a small museum dedicated to the history of the University of St Andrews. The museum, which is free to enter, looks at the University's foundation, student life at the University, and innovative ideas and inventions associated with staff, students, and alumni. The museum also shows a range of temporary exhibitions on different themes. Highlights of the displays include the University's three medieval maces, which are rare examples of ornate ceremonial University maces from the 15th century, and a large astrolabe dating from 1575. The St Andrews Botanic Garden is an 18-acre botanical garden in the Cannongate suburb to the south of the town. It contains more than 8000 species of native and exotic plants. These are laid out in zones of woodland, meadow, shrubbery, herbaceous bedding, a large rockery and a series of ponds. There are also vegetable and herb gardens, and several large greenhouses, one of which contains a butterfly house. The St Andrews Museum is a municipal museum focusing on the history of the town of St Andrews in St Andrews established in 1991 it is located in Kinburn Park. It holds a collection of objects of historical value that are related to the town from the earliest times up to the twentieth century. It is located in the historic Kinburn house named after the Battle of Kindurn during the Crimean war. The St Andrews Aquarium is located on the cliff foot of the Scores overlooking West Sands. As well as over 100 fish species on display there are also penguins and meerkats. As of St. Andrew's Day 2015, the town is formally twinned with the French medieval town of Loches, with whom it had previously shared a cultural exchange for over 2 decades. Celtic art – Pictish stones at St Andrews. ^ a b "Estimated population of settlements by broad age groups, mid-2012 (table 2a)". National Records of Scotland. Retrieved 11 June 2016. ^ Variously Sancto Andrea, civitas Sancti Andrea, urbs Sancti Andreæ, urbs Sancti Andree, Sanctus Andrea, &c.
^ "Ainmean-Àite na h-Alba (AÀA) – Gaelic Place-names of Scotland". www.gaelicplacenames.org. ^ "History | University of St Andrews". www.st-andrews.ac.uk. Retrieved 11 June 2016. ^ "The top 10 universities in the UK 2015". Telegraph.co.uk. Retrieved 16 March 2016. ^ Osborn, Matt; Franklin, Will; Osborn, Matt; Franklin, Will (25 May 2015). "University league tables 2016". The Guardian. ISSN 0261-3077. Retrieved 16 March 2016. ^ Gifford,J., The Buildings of Scotland:Fife (Yale UP, 1988), p. 357. ^ a b Lamont-Brown St Andrews – City by The Northern Sea pp.1–2. ^ a b c Gifford Buildings of Scotland – Fife p.357. ^ Lamont-Brown St Andrews – City by The Northern Sea p.16. ^ Lamont-Brown Fife in History and Legend p.71. ^ a b Gifford The Buildings of Scotland: Fife p.359. ^ a b c d e f Cook Old St Andrews p.3. ^ Lamont-Brown Fife in History and Legend p.76. ^ Lamont-Brown St Andrews –City by The Northern Sea p.19. ^ Omand The Fife Book p.109. ^ a b "Reserved and devolved matters". Scotland Office. Archived from the original on 21 October 2008. Retrieved 6 January 2010. ^ Lamont-Brown St Andrews – The City By The Northern Sea p.188. ^ a b c Lamont-Brown St Andrews – The City By The Northern Sea p.190. ^ "Fife North East". bbc.co.uk. Retrieved 8 May 2015. ^ "Willie Rennie MSP". Scottish Parliament. Retrieved 6 September 2016. ^ "Holyrood 2016: Liberal Democrat leader Willie Rennie takes seat from SNP". BBC News. Retrieved 6 September 2016. ^ a b "List of MEPs". European Parliament. Retrieved 8 November 2015. ^ a b c d e "Comparative Populartion: St Andrews Locality Scotland". scrol.co.uk. 2001. Archived from the original on 23 February 2012. Retrieved 1 March 2009. ^ "Comparative Population Profile: Fife Council Area Scotland". scrol.gov.uk. 2001. Archived from the original on 23 August 2009. Retrieved 1 March 2009. ^ a b "Comparative Employment Profile: St Andrews Locality Scotland". scrol.gov.uk. 2001. Archived from the original on 23 February 2012. Retrieved 1 March 2009. ^ "Comparative Employment Profile: Fife Locality Scotland". scrol.gov.uk. 2001. Archived from the original on 23 August 2009. Retrieved 1 March 2009. ^ "Mid-2008 Population Estimates – Localities in order of size". General Register Office for Scotland. 2008. Archived from the original on 2 July 2010. Retrieved 8 September 2010. ^ "Scotland's most expensive street now at home of golf". BBC. 23 December 2016. Retrieved 23 December 2016. ^ "1990 maximum". Retrieved 22 March 2011. ^ "1971-00 average annual warmest day". Retrieved 22 March 2011. ^ ">25c days". Retrieved 22 March 2011. ^ "July 2006 temperature". Retrieved 22 March 2011. ^ "Feb 1972 minimum". Retrieved 22 March 2011. ^ "Annual average coldest night". Retrieved 22 March 2011. ^ "December 2010 temperature". Retrieved 22 March 2011. ^ "Climate Normals and extremes". Met Office. Archived from the original on 19 October 2011. Retrieved 22 March 2011. ^ Walker and Ritchie Fife, Perthshire and Angus p.79. ^ Historic Environment Scotland. "St Andrews,West Port (SM90263)". Retrieved 21 March 2019. ^ a b c d e f g Pride Kingdom of Fife pp.124–126. ^ Historic Environment Scotland. "Holy Trinity Church (Town Kirk), South Street (Category A) (LB40633)". Retrieved 21 March 2019. ^ a b Lamont-Brown St Andrews – City by The Northern Sea p.171. ^ Fife Regional Council Medieval Abbeys and Historic Churches in Fife p.46. ^ Cook Old St Andrews p.14. ^ Fife Regional Council Medieval Abbeys and Historic Churches in Fife p.22. ^ a b c d Walker and Ritchie Fife, Perthshire and Angus pp.130–132. ^ a b c Lamont-Brown Fife in History and Legend pp.70–72. ^ Historic Environment Scotland. "St Andrews Cathedral and Priory and adjacent ecclesiastical remains (SM13322)". Retrieved 21 March 2019. ^ a b Walker and Ritchie Fife, Perthshire and Angus pp.115–116. ^ Pride Kingdom of Fife p.121. ^ Historic Environment Scotland. "St Andrews Castle (SM90259)". Retrieved 21 March 2019. ^ Historic Environment Scotland. "St Andrews, South Street, Blackfriars' Chapel (34336)". Canmore. Retrieved 4 August 2010. ^ Historic Environment Scotland. "St Andrews, St Nicholas Farm (34312)". Canmore. Retrieved 4 August 2010. ^ "list of primary schools in Fife". Fife Council. Archived from the original on 20 February 2012. Retrieved 5 March 2010. ^ "Cannongate Primary School". Fife Council. Retrieved 8 March 2010. ^ "Lawhead Primary School". Fife Council. Retrieved 8 March 2010. ^ Cook Old St Andrews p.13. ^ "Madras College info, fifedirect". Fife Council. Retrieved 21 February 2009. ^ Johnston, Kristen (9 January 2012). "Council's Madras plan 'fails pupils'". The Courier. p. 1&7. ^ "New Madras College options to be considered by committee". Fife Council. 28 October 2011. ^ a b c "Madras College decision spark outrage in St Andrews". St Andrews Herald. 18 November 2011. ^ a b Alexander, Michael (8 June 2012). "Madras College families facing yet more uncertainty after Kilrymont plan put on ice". The Courier. ^ a b c Lamont-Brown St Andrews – City By The Northern Sea pp183–185. ^ a b c Lamont-Brown Fife in History and Legend p.83. ^ "What does the future hold for St Andrews leisure centre?". St Andrew Citizen. 10 January 2008. Retrieved 4 March 2009. ^ "British Beaches". Retrieved 20 May 2013. ^ "Trip Advisor". Retrieved 20 May 2013. ^ a b "Keep Scotland Beautiful". Retrieved 20 May 2013. ^ a b "Fife.gov". Retrieved 20 May 2013. ^ "Youtube – Chariots of Fire opening scene". Retrieved 20 May 2013. ^ "Chariots of Fire legacy keeps on running in St Andrews". BBC News site. 31 May 2012. Retrieved 20 May 2013. ^ "Chariots of Fire beach scene re-enacted on Olympic Torch relay". The Mirror. 13 June 2012. Retrieved 20 May 2013. ^ "Olympic Torch relay gets Chariots of Fire treatment on West Sands beach". Metro. 13 June 2012. Retrieved 20 May 2013. ^ "High Speed Dirt – West Sands St Andrews". Archived from the original on 24 October 2012. Retrieved 20 May 2013. ^ "You Tube – Rowan Atkinson Sequence – Opening Ceremony – London 2012 Olympic Games". Retrieved 20 May 2013. ^ "Beach Awards - Keep Scotland Beautiful". coastal.keepscotlandbeautiful.org. ^ "Lade Braes". Retrieved 16 May 2014. ^ "Lade Braes Walk – The Sinner's Guide to St Andrews". Archived from the original on 17 May 2014. Retrieved 16 May 2014. ^ Smart, RN (1991). Notes on the Water Mills of St Andrews (1989) in 'Three Decades of Historical Notes' (ed. M Innes & J Whelan) p.179. ^ "History of the Lade Braes". Retrieved 2 June 2014. ^ "Buildings at Risk Register, Law Mill". Retrieved 16 May 2014. ^ "Dictionary of the Scots Language :: SND :: Brae n.1". www.dsl.ac.uk. Retrieved 14 March 2017. ^ "St Andrews Botanic Garden | Home". St Andrews Botanic Garden. Retrieved 15 April 2018. ^ "St Andrews Museum, St Andrews – Museums". Visit Scotland. Retrieved 15 April 2018. ^ "St Andrews Aquarium". www.standrewsaquarium.co.uk. Retrieved 16 April 2018. ^ "St Andrews twinning pact signed in saint's celebrations". This article incorporates text from a publication now in the public domain: Chisholm, Hugh, ed. (1911). "St Andrews" . Encyclopædia Britannica (11th ed.). Cambridge University Press. Pride, Glen L. (1999). The Kingdom of Fife (2nd ed.). Edinburgh: Rutland Press. ISBN 1-873190-49-2.